Cyber Skate: Andrew Langi does a front-side fastplant while testing ZeroOne's high-tech skateboards at Campbell Skate Park. You meet a squirrel—he wants you to do karaoke. A South African artist wants to turn your skateboard into a musical instrument. What is going on? It's the ZeroOne festival, and it's a full-scale art attack on San Jose. is how newness enters the world. DONATED art hangs from the walls while mechanics wrench on vintage autos. A dog lounges in the parking lot, basking in the hot sun. Classic rock emanates from inside the space. I'm over at the Ministry of Transport, a foreign car repair shop with an art studio attached next door. Located on a sleepy side street in an unincorporated portion of Santa Clara County, the yard is filled with beat-up cars, metal sculpture and all sorts of oddball projects in various states of progress. Artists Katie Salen and Marina Zurkow are busy working on an ice cream truck that will eventually house a full-blown karaoke system, complete with lighting, a disco ball and computer software. The two New York-based artists, along with Nancy Nowacek, were awarded a residency for ZeroOne: A Global Festival of Art on the Edge, which debuts next week in conjunction with ISEA 2006, the International Symposium on Electronic Arts, a rotating worldwide gathering. For the ice cream truck, a man-size squirrel will pass out popsicles through the side window and run around outside to solicit karaoke singers in the vicinity of Plaza de Cesar Chavez during the two festivals. In a previous interview, Salen explained it: "Cesar Chavez Plaza is a site with deep historical and cultural significance in the context of immigration, workers' rights and social histories—it is also a site of temporary interactions, a plaza that people pass through on their way to work or hang out in for a few minutes to rest or eat. We loved the idea of considering these histories in light of the new populations of people that would descend on the plaza during the festival." 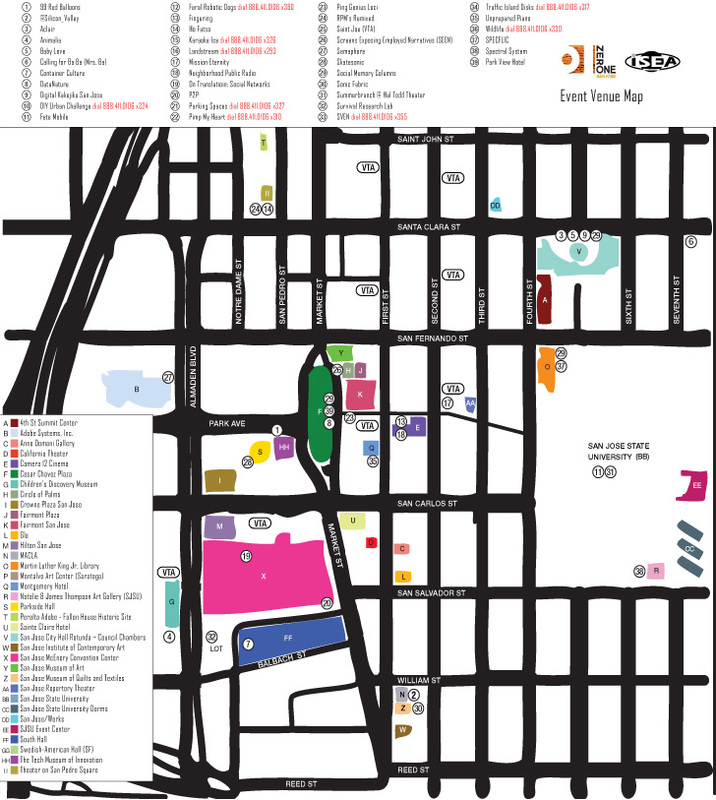 In the same interview, Zurkow added, "As San Jose doesn't seem to be a very pedestrian environment, this festival will incite much running up against strangers. Couple that with the 'trawling posses' mentality of conference-goers: there's a lot of potential there for mischief and spontaneity." Founded in the Holland in 1990, the Inter-Society for the Electronic Arts (ISEA), calls itself "an international nonprofit organization fostering interdisciplinary academic discourse and exchange among culturally diverse organizations and individuals working with art, science and emerging technologies." Its members run the gamut: artists who map DNA structures onto cityscapes; scientists who model computer networks after social networks; theorists who apply French poststructuralist philosophy to video-game design. Primarily a coterie of scholarly types, ISEA has staged symposiums all over the world, usually featuring paper presentations and panel sessions where a handful of academics talk about things like isomorphic pseudogender architecture. The phrase "electronic art" barely even describes it, really. You'll see discussions about everything from pirate digital radio to poly-scalar heterotopic botany. This time it will be somewhat different, however. ISEA 2006 in San Jose will morph and run concurrently with ZeroOne, a huge digital arts jamboree that will literally take over downtown San Jose with over 100 projects. There will be exhibits, live cinema, performances, workshops and all sorts of site-specific high-tech goings-on. It will not be—and this is important—a straight-up showcase of technology. You will witness innovative contemporary artists from around the planet using technology as a tool to create their art in the same way a painter uses a paintbrush. Like any renaissance thinker, these folks understand that art, science and technology are not separate elements. They're just different approaches to understanding the world. The local academic host for both festivals is the CADRE Laboratory for New Media, which is housed within the School of Art & Design at San Jose State University. CADRE, which stands for Computers in Art, Design, Research and Education, goes back 20 years, and over time has evolved into a uniquely interdisciplinary new media institution—originally one of the first of its kind in the country. Everything you can imagine has gone on there: artificial intelligence research, computer animation, high-tech culture jamming, game theory and, most recently, the experimental use of information technology and art. In 1997 I infiltrated a class at CADRE where the whole group conducted a site-specific conceptual art happening outside Area 51 in Nevada. Since photography of Area 51 is illegal, they all stood there with easels and palettes and painted the landscape as a countersurveillance of Area 51. That's the kind of attitude and frame of mind you'll see in many of the projects at the ZeroOne festival. CADRE used to be officially called the CADRE "Institute," but director Joel Slayton eventually changed the name to the CADRE "Laboratory," a much more applicable nom de plume. In conjunction with ISEA/ZeroOne, a CADRE 20th anniversary exhibition featuring works from noted alumni will take place at WORKS/San Jose, with a reception and performance on Aug. 8. So many different projects and performances will occur at ISEA/ZeroOne that it becomes a daunting task just to keep track of them all. (See special guide for some of the highlights.) With all due respect to everyone else not mentioned here, we only have room to provide a small window into the vast array of exploits that will comprise this distinctive festival. Possibly the most important aspect of ISEA/ZeroOne is its vastly interdisciplinary scope. It's not a just a high-tech carnival, an arts conference, a poetry slam or a theater festival. It's all of the above. Here's an example: Troika Ranch is a Brooklyn-based digital dance theater troupe that will do two gigs at the San Jose Repertory Theatre. They specialize in shows where the dancers trigger live audio and video accompaniment with their movements. Motion-sensing technology tracks the dancers' movements and then the data is piped to a computer that uses that data to compose real-time 3-D imagery and audio. And speaking of the word "multidisciplinary," 10 years ago, Troika Ranch artistic directors Mark Coniglio and Dawn Stoppiello coined the term "slash artist" to describe both themselves and other artists who create hybrid work. One night they encountered a bunch of artists at a party who were saying things like, "I'm a composer slash videographer," or, "I'm a poet slash technologist slash actor," or, "I'm a UNIX hacker slash gearhead slash performance artist." Troika realized that what these artists all had in common was that they were practicing hybrid combinations of different artistic disciplines and there was no common moniker to describe it. So they invented the term "slash artist" because what's important is the slash. "That's what everybody was saying [at the party]," Coniglio explained over the phone from his Brooklyn home. "Nobody was just saying, 'I'm a poet.' Or 'I'm a musician.'" He then recalled a New York Times writer being at the party: "She said that the word 'multidisciplinary' sucked because it took up an entire column. So we decided that we'd better come up with another name." For the ZeroOne festival, Troika Ranch will perform 16 [R]EVOLUTIONS, an internationally funded and supported high-tech work that condenses 100,000 years of evolution into an evening-length performance. It begins with the pure drives of the pre-human animal and ends with today's post-intellectual man. Troika recently performed it in England, Germany and Fresno. And a wide variety of folks show up to Troika's performances. "The hard-core dance audience is not our No. 1 audience," Coniglio said. "There certainly are dance people there, but it's really people who love experimental theater, experimental film, who have some interest in technology. Sometimes I think that the dance community has a rigid hold on what dance is, and we're really trying to expand that vocabulary. So those are the people that really tend to love our work, actually." If digital dance theater dance ain't your bag, maybe skateboarding is. Since San Jose has a rich history of skateboarding, especially street skating, it only makes sense that an artist all the way from South Africa would come here on a commission to do a high-tech skateboard-related project. Cobi van Tonder has a wide background in music and interactive art. She mentions in her artist statement that "the development of interactive art is particularly exciting, since it enables its creator to merge, according to her liking, a multitude of disciplines in performance, sound and visual art." And this time, it's all driven by a skateboard. The board is equipped with a wireless microphone, proximity detectors and a battery pack. Sensors underneath the board pick up data and audio from how the person skates. This includes the raw sounds as well as the acceleration and 3-D spatial positioning of the skateboard and its parts. The information and the audio is piped from the skateboard to a graphical programming environment called MAX/MSP, a once academic but now-universal package originated by computer music research guru Miller Puckette 20 years ago. Depending on what the skater does, MAX/MSP will generate new sounds on the fly, play already-composed sound bites and pretty much interact with what the board is doing. "The way I like to see it is that the music is riding the skaters instead of the skaters riding the music," van Tonder explained from her studio at Villa Montalvo where she's staying. "It's a feedback loop, but I prefer to see the focus on [the fact that] these riders wouldn't exist if it wasn't for the music. So they become a function of the music as opposed to thinking the other way around." The ZeroOne festival tackles several different themes and this commission relates to the theme of Transvergence. "Since it was a commission in California, I wanted to find a subculture, or something that speaks to this land," she said. "My first choice was to do surfboards, actually—to do something in the water—but it had to be on land, because the festival is in San Jose. So, skateboarding was kind of the next, I thought, coolest subculture to interface with." Originally she wanted to build a ramp at the new City Hall, but since they recently booted out all the skaters who were shredding on the steps out front, van Tonder had to choose Plaza de Cesar Chavez instead. "What appealed to me right in the beginning was the no-skating signs at City Hall," she explained. "And if I could get permission and do a piece there, it would be great. ... I wanted to do it inside the rotunda. I wanted to build this beautiful round pool in there and have people stand on that balcony and look down on it." But, alas, the city denied her. Here's an artist all the way from South Africa who wants to put cutting-edge technology and skateboarders inside the rotunda and they wouldn't let her do it. Oh well. If this all sounds too techie-dorky for you, have no fear. A much more ominous crew of folks have been getting their hands dirty, literally, for quite some time now in preparation for ISEA/ZeroOne. He Must Be Nuts: Mr. Squirrel wants you to do karaoke to your favorite songs done in the style of ice-cream-truck music. The only ISEA symposium I ever personally attended was in 1996 when it was in Holland, and nearly every Dutch person I spoke with gave the same response after finding out I lived near San Francisco. Here's what they all said: "Ah, San Francisco! Survival Research Laboratories!" Everyone at least knew of those legendary S.F.-based troublemakers who stage gargantuan machine/robotic spectacles that require cases of earplugs due to the bombastic noise. Room-size robots pound on each other. A replica of a V-1 jet engine doubles as a flamethrower and a low-frequency generator. A pitching machine shoots 2-by-4 slabs of wood at 200 miles per hour. A hovercraft battles it out with a metal inchworm as big as your garage. Shards of every metallic substance fly everywhere. All senses are catered to and it's all there: flames, metal, gasoline, noise, destruction and that ever-necessary pie-in-the-face ridicule of everything that is consumer culture. Don't be surprised if you see an appropriated Wal-Mart billboard get obliterated at full volume by a gigantic remote-controlled walking machine. Those are the kinds of shenanigans that go down at an SRL show. SRL's previous shows have been graced with such Situationist-like titles as "The Arbitrary Calculation of Pathological Amusement" and "A Calculated Forecast of Ultimate Doom: Sickening Episodes of Widespread Devastation Accompanied by Sensations of Pleasurable Excitement." That last one took place inside a warehouse near a pier in S.F. and was marred by a bogus ticket scandal, unbeknownst to SRL, which left many of us watching the spectacle from outside. And yes, they're going to invade downtown San Jose for the ZeroOne Festival. It is the first grand-scale SRL show in the Bay Area in about a decade. They don't have to fill an entire shipping container and send it off to Japan for this one. Instead, probably about 30 crew members will descend upon the site and spend a week setting this up. The SRL compound, if I remember it correctly, is a cavernous warehouse/machine shop underneath a freeway interchange in San Francisco, filled with probably 100,000 tools, pieces of scrap metal, subversive paraphernalia, old signs and pieces of every matter imaginable. And that's aside from all the robots. A wide variety of individuals have come to work there throughout the last 25 years. As I write this, dozens of folks are there, poring over electrical schematics, building the props, exhuming old machines from 10 years ago, wrenching on all sorts of stuff and making an absolute racket. Director Mark Pauline, who founded SRL in 1978, said that this show will also feature one of those long titles that SRL is known for, but it won't be released until just before the show. At presstime, they were hyping the show as "Six Flags Over Hell," and the theme will concentrate on Dante's Inferno. It will be a hot August night, to say the least. The beauty of ISEA converging with ZeroOne is the sheer variety of events and programs that will go on. There literally is something for everybody. You've got ice cream truck karaoke, high-tech dance theater, computer music created by skateboards and SRL's pulse jet engines spraying hurricanelike flames all over the place. And it all ties in with a celebration of the 20-some-odd years that the CADRE Laboratory at SJSU has participated in the evolution of new media technology. And speaking of CADRE, the best way to complete our little glimpse into this festival would be to briefly visit the current exhibition at WORKS/San Jose, the CADRE 20th anniversary show, made up of projects from CADRE alumni from years past. For that show, you've got computationally derived wilderness trails, reversible automata and a tug-of-war rope attached to a computer. CADRE students have always been known for their wacky, satirical approach to things, and it all comes through in the exhibit. For the opening reception of the WORKS show, all sorts of folks came out of the woodwork. Former CADRE students who've moved on to teach in universities rolled back into town. It was a microcosm of everything that ISEA/ZeroOne will be: A little bit of this and a little bit of that—a mélange, an interconnected hodgepodge of everything.